All this week I'm counting down a highly arbitrary selection of my top 8 photos of 2006, leading up to the Daily Photo theme day for January 1: the best photo of the year. You can still tell me your thoughts on your personal favorites from this year (Gerald from Hyde is doing the same but was kind enough to pick his top ten to make it easier for you to vote - great idea, Gerald, and sorry I didn't do the same!) I’ll take all votes into account when I make my final selection for the Year’s Best Picture. Today’s shot is from early April, shortly after I started the blog. I think it's sweet! 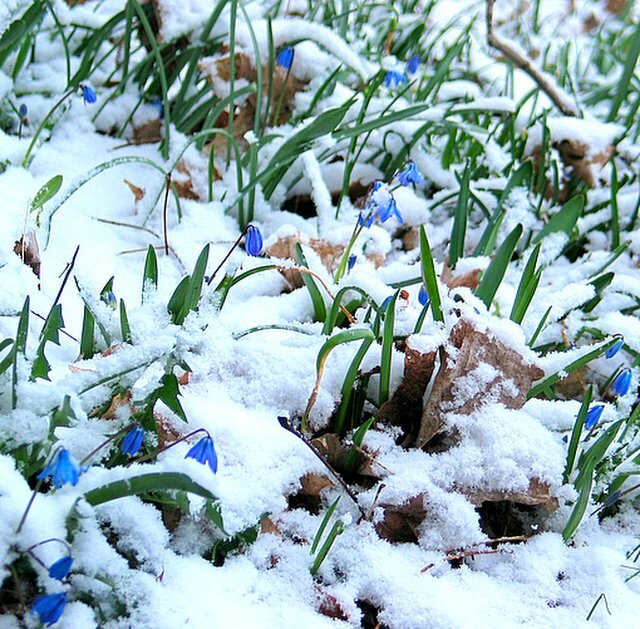 magnifique, ces fleurs bleues sous la neige, c'est superbe. I love this photo. This is going to sound weird, but delicate flowers like this make me think of women. They may look delicate and small, but look how tough & tenacious they are! "You can't judge a book by its cover." Jenny, I hope you have another outlet for these photos besides your blog! More people need to see your talent. Jenny, have a great New Year’s eve and all the best in 2007.
i echo everyone's comments. your picture looks great. i can feel the crisp cold snow from your picture!